Setting foot inside this picturesque cabin, nothing but relaxation or play awaits you. Take in the stunning beauty through three picture windows giving you stunning views all the way to Lake Lemon less than two miles away. Relax in an amazing salt water hot tub after a day of shopping in Nashville or visiting neighboring wineries. Bring the family and let them play pool, darts, or poker on site or go to nearby Lake Lemon. There is more than enough room for all of them along with your four legged kids. Imagine sitting around the dining room table with a roaring fire laughing and sharing memories that will last a lifetime. Stagecoach is true to its name. This completely renovated historic home dates to as early as 1840. During its long history, it served as a toll house for stagecoaches traveling on the private toll road running north of Nashville on Jefferson Street. You will notice details of the original exterior brick, wood floors, and six over six sash windows – all characteristics of pre-civil war buildings in Indiana. The home is located one block from all the downtown shops, restaurants and entertainment on a private 1 ½ acre lot with view. Stagecoach has two bedrooms, one queen and one full, one full bath and half bath, full kitchen with gas stove, dining room, and large living room. After a long day of shopping, guests can relax in a private outdoor hot tub or sip wine on our covered front porch. And, make sure you leave time for fun. The home features a puzzle table (with lots of fun puzzles and games), WiFi and Hulu (for binge watching your favorite shows). There is ample covered parking (remember, you don’t have to pay for any parking while you are staying with us because we are within walking distance of everything!). We welcome small fury friends and they will love our extra-large lot for running and playing. The 1891 Schoolhouse Inn was meticulously renovated in 2016 by Dennis Parman of Peaceful Valley Construction. Preserving the history and charm was important. The Schoolhouse Inn has retained many original features including the heart pine flooring, wainscoting on the main floor, 7ft windows with original glass panes and belfry with the original school bell. New custom built cabinetry and beautiful wood counter tops in the fully equipped kitchen awaits you with a Jenn-Aire gas range, full size refrigerator, dishwasher and all the tools and gadgets you need to fix a hearty breakfast or that perfect feast. In the spacious living and dining area with 12ft. ceilings you may enjoy your meals at the 1810 Stretcher base table surrounded by comfortable Windsor chairs. The large picture window provides a perfect view of the wooded ravine. In the beautifully decorated great room with deck access a wall of glass overlooks the back deck and woods as far as the eye can see. Here you can enjoy the big screen satellite TV and DVD player or curl up on the comfy leather coach and enjoy a good book and a glass of wine. The pot bellied stove has been replaced by a gas log fireplace for rainy days and cold evenings. After a long day of biking or hiking, the newly renovated bath features a large walk in tiled shower and a new custom build cabinet with loads of counter space. With the on demand water heater you can enjoy that hot, soothing shower for as long as you like! The large private deck features a four person hot tub, patio table and a gas grill and firepit for your continued outdoor enjoyment. From the deck you will enjoy wooded views all year round as each season offers a unique panorama. As bedtime approaches, up the loft style staircase you will find the first of two cozy bedrooms with queen size pillow top beds. The first settlers came to Brown County around 1820. There were no formal schools until 1835. Hedgesville, a community in the eastern part of Brown County which no longer exists, established the first school. This only lasted for a short time. The second school was constructed in Nashville, two years later. This school was built of native logs and lasted five years. The state legislature set up a system to provide supervision over the schools in each community. Each of the five townships in Brown county had a township trustee that oversay the building of schools and hiring of teachers. The plan was that every school house was established withing walking distance of each child’s home. The trustees were paid a salary out of which they were to finance all this plus buy books, buy firewood, furnish the school, and take care of maintenance of the building. On the south side of Yellowwood State Forest, halfway between Nashville and Bloomington, Hearthstone is your gateway to the great outdoors. Right on the Scarce O’ Fat Loop, this hiking trail will take you right into the heart of forest winding towards Yellowwood Lake. Whether you’re out for a casual walk or more adventurous jaunt, Hearthstone connects with several trails located in the forest allowing you to explore the beauty of Brown County or travel to the beaches and boat ramps of Lake Monroe just 25 miles away. When you’re done relax in front of the amazing fireplace in the living room while the family enjoys themselves around the dining table, kitchen bar, or breakfast nook. This open concept mid-century home allows everyone to be part of the conversation. 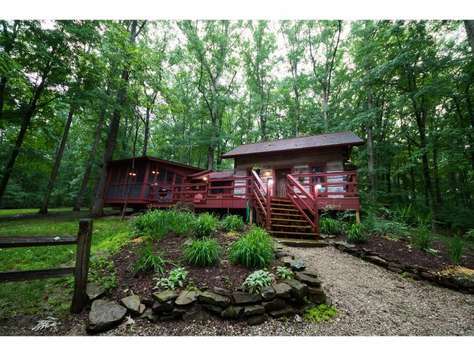 This brand new luxury log cabin is a 4 BR 3 BA located right outside of Nashville, close to Lake Lemon, and moments from Bloomington. Stay and relax in the stylish log home featuring all your modern amenities including 2 4KHD TV’s with satellite service and Blue Ray DVD players. Bring your own favorite movie or choose from our selection featuring superhero movies, comedies, romance, and popular children’s movies. There is no shortage of gaming opportunities. Try your hand at bumper pool or maybe chess or checkers are more your speed. You will find a table in the basement to play your favorite board game or use to play a game of cards. When your belly starts to rumble, you will find everything you need to prepare a great meal. We have a crockpot and even a waffle maker for great country breakfasts. Just bring your favorite supplies. We have a gas convection oven and all new stainless steel appliances. Our dining table has an additional leaf to seat more people, or you can use the outdoor dining options as well. We have a large charcoal grill on the deck just outside the kitchen. If you are hoping to relax, you have come to the right spot! Our brand new Royal Spa hot tub is ready for your enjoyment. The hot tub looks out over our wooded acreage and is covered by our upper deck. Even if it’s rainy, you can still enjoy the hot tub. You will find you have several options when it’s time to rest. We have two master suites. The upstairs suite offers the most privacy with its own private bathroom and barn doors for charm. The king size hybrid mattress offers the ultimate comfort. The second master suite is on the main level, is attached to the main floor bathroom, and features a new king size cool gel memory foam mattress. The other bedroom on the main level features a queen size bed with a new memory foam mattress. On the walkout level, you can comfortably sleep three with a set of bunk beds and an additional twin size bed. With the blackout shades in this room, maybe the “Luck of the Irish” will help the kids sleep a little later in the morning. We feature 3 bathrooms, one on each level. Our tankless water heater will ensure no one has a cold shower. If you still need convincing, you will find a gas fireplace in the main room and an electric fireplace in the basement. We have a firepit in the woods for s’mores and a hammock for relaxation. Looking for a spa getaway that offers you a hot tub, gazebo surrounded by trees as far as the eye can see, a pond with deck and stocked pond? Then Relaxation Station is waiting for you. Each area of this one bedroom cottage offers a different way to kick back and let all that worry melt away. When moving inside you’ll seamlessly go from nature to rustic with the touches of a hickory hardwood floor and handmade dining table to modern conveniences in the kitchen and bathroom. Hideaway in the gazebo and listen to the subtle sounds of nature while enjoying your favorite book. Take a stroll down to the fishing pond where you'll see a peaceful flowing fountain or bring the fishing poles and take a shot at catching that big fish to tell stories about! Enjoy a hike on one of the many walking trails with the abundance of wildlife joining you. If you need to unwind, and want some much needed private time with someone special, Relaxation Station is the place for you! 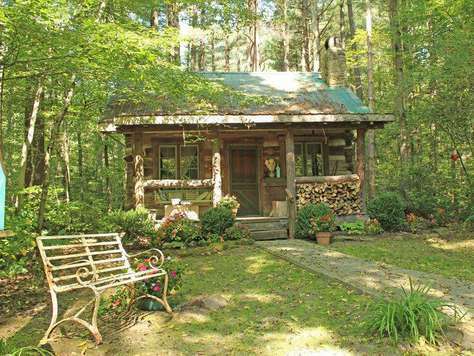 Step back in time….. way back…… This 150 year old honest-to-goodness real Log Cabin is nestled on the edge of a pine forest…. secluded, yet just minutes from the village of Nashville. A secluded getaway in the “Hills of Brown County, Indiana.” Experience something uniquely different and satisfying! Old antique piesafes, cupboards, chests, tables and garden items contribute to the warm back-in-time lifestyle of the Garden Cabin. If you want to truly “get-away” and experience something uniquely different and satisfying, please contact us for reservations. Perched atop the highest point of Locust Lane, we bring you Artist Lane Cottage, where at the turn of the century many artists in the town of Nashville called this lane home. Artist Lane Cottage in particular was once home to artist Will Vawter. Cathedral ceilings, original layout of the studio, and located in the heart of the village of Nashville makes this cottage the ideal getaway for those looking to vacation with all the comforts this quaint little town has to offer. Whether you bring your pet and let him in thru the doggy door or take your special someone on a bike ride with the 2 provided beach cruisers, there will probably be more activities available than you will have time for. 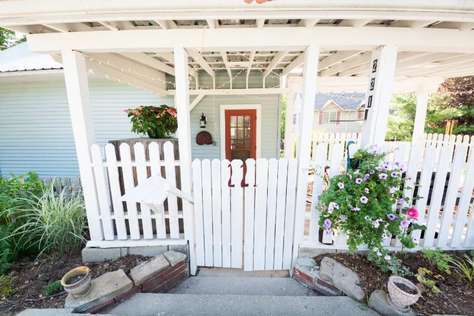 Let’s step inside and show you everything Artist Lane Cottage has to offer. Artist Lane Cottage is a 2 bedroom 1 bath vacation home with many of the original features of the home. The kitchen laid out in all bright white invites you in as the sun rises thru the beautiful large windows throughout the space. A dishwasher, microwave, gas stove, and a washer and dryer are provided for your comfort. A gas grill also is on site for the grill master within you. Artist Lane Cottage awaits your stay in the heart of downtown Nashville. Open your eyes to Big Sky Cabin! This 4400 sq ft vacation home is a beautiful example of new prairie school design and is overflowing with amenities. Four bedrooms with 4 queen beds and 2 king beds provide plenty of room for 8 guests. The incredibly unique finishes in this home will have you bragging to your friends and wanting to come back for more. There is plenty to do at the cabin whether it be the hot tub, pool table, ping pong table, air hockey table, free wireless internet, outdoor play area for the kids or the gourmet kitchen. There is a large covered front porch, a covered deck in back and an open deck in back - you pick where you want to relax! The game room features a wet bar, fireplace and a large flat panel TV. This property is just 1.5 miles from Nashville so you can shop or dine in town and then be back in the hot tub in less than 10 minutes. If you book this cabin with friends be the first to arrive and stake your claim to the master suite with the "wrap around" shower - can you say AHHHHH? If you are a reader enjoy "The Loft" upstairs where you can read and enjoy the surrounding views including a spectacular view of both sunrise and sunset. Big sky is also very convenient Bloomington just 15 miles down the road. Price structure is base rate for 2 people for one bedroom only if your choice, all other rooms will be locked. Includes all main spaces of the cabin, bring your friends for an additional rate! Blue Bird Cabin may be one of the most unique and breathtaking cabins in all of Brown County. The cabin was built with antique logs, beams and barn siding that came from a number of cabins and barns all over southern Indiana and northern Kentucky. The massive 22’ tall Brown County stone chimney is the centerpiece of the 30’ x 30’ vaulted ceiling great room. On the inside is a wood stove and a pizza oven and on the outside under the covered porch is an open fireplace. All the doors and drawers have their handles and hooks made from reclaimed railroad spikes. The kitchen countertop is made from limestone quarried near Nashville. The dining table was built from a 150 year old walnut tree harvested right here in Brown County. The master bathroom has a pottery pedestal sink, an oversized, claw-foot tub large enough for two and a huge ceiling mounted, rainfall, showerhead that feels glorious. The master bedroom boasts a king sized bed, side tables and wardrobe built entirely from antique barn beams and siding. It has its own romantic wood stove and its French doors open to its own private screened porch. The cabin sits on a serene pond that is full of fish and is great for a summer swim. The cabin and pond are surrounded by 30 acres of wood that have several marked hiking trails to enjoy. Those who come to Blue Bird Cabin always want to return. Now you might understand why! This quaint cottage was dubbed The Buffalo Nickel after discovering the historical information regarding an early owner of the property. When the owners were remodeling the property, they found several copies of the Indianapolis Star Newspaper being used as insulation. Due to the age of the newspapers, the history of the property was researched. One of the earliest residents was an elderly woman, whose father had settled in Brown County around the turn of the century and her most prized possession were two small nickels he had made when he first settled here. She told shared the story with her local paper boy and showed him the nickels in an effort to teach him a lesson about hard work. Buffalo Nickel is located on the north-end of the Village of Nashville, visitors have a view of downtown Nashville from the 300 square foot deck with overhanging black locust tree with a hot tub!! It consists of a full kitchen, breakfast bar and dining area. There is a living room with queen sleeper sofa, bathroom with custom shower and access to deck, and a bedroom with queen bed. There are two 32" TV's in this cabin. Buffalo Nickel will accommodate 2 to 4 people. The Garden Cabin is one large country dining-kitchen-great room downstairs, with a spacious, many-windowed loft bedroom upstairs. Two large beds and an old wicker sitting-reading area overlook a huge Brown County stone fire place. Cozy up in front of a crackling fire on cool evenings. Then watch the glowing embers from your loft bedroom as you retire. Or…. On a warm balmy evening rock on the old-time front porch swing and listen to the spring-peepers and owls as they tune up for their nightly concerts. If you have always wanted to try one of those old-time claw-foot tub baths – well here’s your chance. Take a good book and soak, relax and read…. no interruptions or schedules to keep. A true log cabin with plenty of bedrooms and plenty of room for our guests, a large hot tub, 2 fireplaces (gas), private pond , dramatic interior wood finishes, full kitchen, 5 bedrooms, 3 1/2 bathes, pool table and located on a secluded 5 acre patch of heaven. 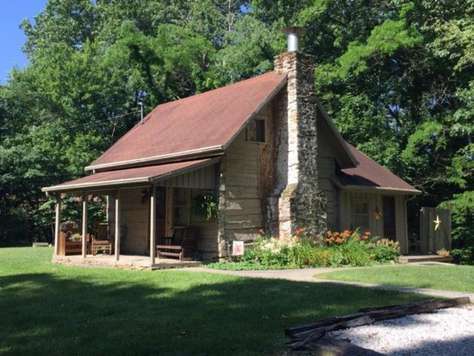 Grand Cabin is just 1.5 miles from Nashville, 17 miles fromColumbus IN, 15 miles from Bloomington including Indiana University and 4 miles from Brown County State Park. Grandma Barnes Cabin is located just 3-1/2 miles from Nashville, Indiana, and close to Bean Blossom, Indiana, between Columbus and Bloomington. This private hideaway has all the comforts of a modern home while retaining its Brown County aura of rusticity. The cabin has a bright, comfortable kitchen with dining area. The large screened-in porch provides ample opportunity for bird and deer watching or just relaxing. A backyard patio, barbeque grill and picnic table complete this romantic picture. The original cabin, built in 1949, sits on a four-acre wooded hillside. We added an 1859 cabin to the original to create a delightful and secluded one bedroom, one bath retreat. This cabin accommodates up to four guests with one queen-sized bed and an inflatable queen mattress. Your pet is also welcome here. 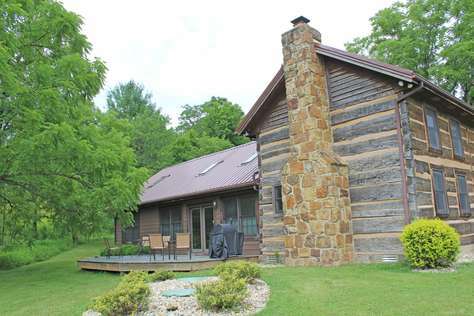 Step back in time….. Stay in this 150 year old real Log Cabin – surrounded by 250 acres of Brown County woods. A secluded, unique and cozy get-away – just minutes from the Village of Nashville and Brown County State Park. The Kelly Reed Cabin is a special piece of the past – with all the conveniences of the present. The Kelly Reed Cabin is a fully restored 150 year old two-story log cabin. Downstairs a large great-room features a real Brown County store fireplace, a dining area with a large harvest table, and a fully equipped kitchen. Dine inside by the fire or enjoy eating and relaxing on your covered porch/deck. The two bedrooms – one downstairs and one upstairs, plus an old-fashioned loft third bedroom all have full-size beds – including one specially handmade from a giant sassafras tree. If you always wanted to try one of those old-time claw-foot tub baths — well, here’s your chance! Take a good book and soak, relax and read… no interruptions or schedules to keep. The cabin also has a second bath with a shower. On warm, balmy evenings rock on the old front porch swing and listen to the spring peepers and owls as they tune up for their nightly concert – or on a crisp, cold, snowy night, put another log on the fire. Old antique piesafes, cupboards, chests, tables and garden items contribute to the warm back-in-time lifestyle of the Kelly Reed Cabin. If you want to truly “get-away” and experience something uniquely different and satisfying, please contact us for reservations. Downstairs features a large great-room with a Brown County stone fireplace, dining area with a large harvest table, and a fully equipped kitchen. The Kelly Reed Cabin has three bedrooms, one upstairs and one downstairs, and an old-fashioned loft bedroom, all with full-size beds — including one made from a giant local sassafras tree! Enjoy a soak in the old-time claw foot tub or take advantage of the second bath with a shower — a real plus when for vacationing families or groups of friends. **New Addition!! ***** Can’t get enough of the water? The three sprawling decks of the Lake House will allow you to capture any view along the shoreline of Lake Monroe. The four acre property provides you plenty of privacy to take in the stillness of the woods and the lapping of the water against the rocks. Wake up every morning to the site of the Lake enjoying your coffee on the private master balcony. Have the family enjoy the sunset outside in any weather from the covered deck or from the hot tub. A large wrap around deck, with treehouse and allow you to enjoy the outdoors with all the luxuries of home. 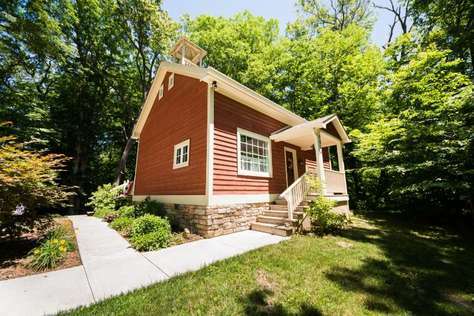 Sitting on a private 10 acres, Lemon Ridge Lodge is nestled on the south ridge of lake lemon, this cozy cabin is 15 min. from the Indiana University campus and 15 min. from Nashville, Indiana. This beautiful lodge comes with a large wrap around deck, a treehouse, hot tub and a full finished basement that sits on beautiful wooded acreage to hike and enjoy the outdoors. You will find all the luxuries of home: Direct TV, 2 bedrooms and a loft bedroom with 3 full bathrooms and a finished basement. Enjoy Bloomington, Lake Lemon, Nashville and Yellowood State Forest while staying in luxury. Book Today for a great outdoor get a way! Now under new management you will not want to miss the opportunity to stay in this recently renovated log cabin that is so conveniently located to downtown Nashville, Indiana. The spaciousness of The Log Inn, located close to Little Nashville makes for a comfortable, convenient accommodation you will not want to leave. Enjoy the natural wooded setting with a beautiful view from the deck. Enjoy the large hot tub after you have spent the day in the Village shopping or hiking in the Brown County State Park that is less than 1 mile away! Ample accommodations include 3 queen sized bedrooms, one including a day/trundle bed and 2.5 bathrooms. The master bedroom on the main floor has a private bath complete with a large whirlpool tub and seperate full sized shower. Relax in the great room absorbed in your favorite movie on the TV or peacefully swing on the covered wrap around porch. The generously equipped kitchen will leave the gourmet chefs excited to prepare the next meal should you choose not to eat at one of the wonderful restaurants nearby in the village. Once you have settled in take a competitive break and play a game of pool or enjoy the large sunroom that has a 6 person hot tub right off the master bedroom or living area! Miss Loretta's Cabin is situated on 11 scenic acres and adjoins Yellow Wood State Forest, providing miles of hiking opportunities. This partially wooded property provides peace, quiet, beautiful scenery, and visiting wild life. 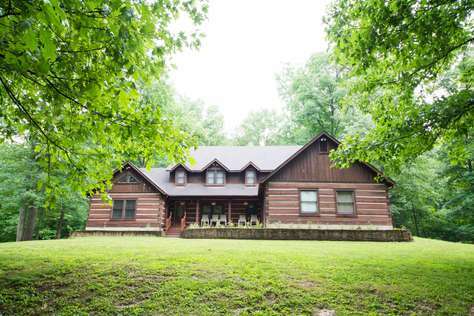 Whether the occasion is a gathering of friends/family or a romantic getaway, this Brown County log cabin provides the perfect setting. There are three bedrooms (2 with king beds and one large bedroom with two queen beds) plus a queen sofa sleeper in the living room. The year-around sunporch with its large dining table and comfortable chairs is a very popular spot for meals and for craft projects. The back deck provides outdoor entertainment with its six-person hot tub, comfortable seating, and propane grill. A covered front porch is also a place to gather. The ground level patio features picnic tables and a fire pit for roasting hot dogs or marshmallows. Guests may enjoy the wood-burning fireplace while nestling in cabin-style living room furnishings. The lower level features comfortable furniture plus pool table, gas fireplace, TV, ping pong table, and access to a large screened porch, also with picnic tables. At the end of the day find the "secret room,” pour a glass of wine, and look out over the forested surroundings. This is a premier cabin in Brown County. 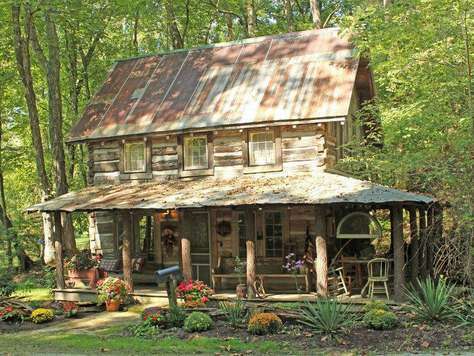 Situated just 8 minutes from Nashville, Indiana you can unwind at the remarkable, picturesque Meadow Valley Cabin! The Meadow Valley Cabin is an 1860's hand hewn log cabin completely renovated in 2002 and a large addition added on. This log cabin has the perfect blend of modern and rustic. Sitting across from the pristine Hernandia Stables, a Paso Fino horse farm, you will enjoy the steller view of Brown County and the horses grazing in the pastures. While visiting the Meadow Valley Cabin, you will be immersed in the country and wildlife with the quaint setting of the farm, with each season offering a unique experience. 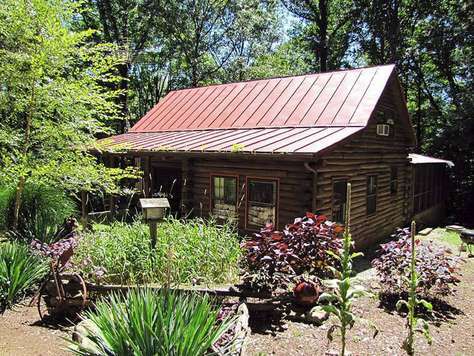 The naturally lit log cabin features 3 bedrooms with king beds, sleeping 6 guests total. The full kitchen has all the ammenities to prepare a meal to be shared in the large dining area. Enjoy the foosball table in the loft or check out the antique features throughout the cabin. Outdoors you can relax in the hot tub or start a fire in the pit located off of the back patio near the charcoal grill. Meadow Valley is conveniently located close to Bloomington and Columbus, Indiana as well as Brown County State Park,Yellowwood State Forest and nearby local attractions. Come and visit us at Meadow Valley Cabin, you'll be glad you did! If you come to Brown County to visit the unique boutiques and galleries and want to be within walking distance of the variety of restaurants then the Nashville Suites are for you. Built in the late 1800’s and home to the well-known Brown County artist, Fred Rigley these suites are located in the heart of Downtown Nashville. Our guests will enjoy the well decorated large rooms and high ceilings with modern amenities. Each Suite has a separate entrance from the outside with off the street parking in the rear of the building. If desired, both suites can be joined to accommodate additional guests. The Nashville Suites have a convenient free shuttle pick-up out front for the annual Indiana Wine Fair in April. Or enjoy the long list of community activities, including the Fall Fair and Spring Blossom Parade, horse-drawn carriage rides and all the local shoppers passing below. What perfect lodging for your girl’s trip! This Suite offers a comfortable king size bed to sleep 2, as well as a love seat and television. A full tub/shower and double sink allow 2 guests to get ready for whatever activity they have planned for the day. Enjoy your morning coffee at the table in the adjoining room with a small fridge, microwave and coffee maker overlooking Jefferson St. If you come to Brown County to visit the unique boutiques and galleries and want to be within walking distance of the variety of restaurants then the Nashville Suites are for you. Built in the late 1800’s and home to the well-known Brown County artist, Fred Rigley, these suites are located in the heart of Downtown Nashville. Suite 2 is accessed from outside up its own separate staircase. A spacious bedroom with a king-size bed and vintage furniture offer a relaxing place to retire too after a long day of shop-hopping. Guests will enjoy a full size kitchen complete with modern appliances to cook your own meals. The living room with high ceilings, sofa, and cable television is perfect for reading or watching a movie. Overlooking Lake Monroe stands Soaring Eagle Log Cabin. Just 50 feet from the water line of the backwaters of the lake Soaring Eagle is a relaxing and romantic place to be. The view of the lake from the deck or hot tub is extraordinary year round. The quietness of the remote location is striking and will leave you wanting to stay "just a few more days". This pet friendly home features a master bedroom with a king bed, a queen Murphy bed in the game room, 1 1/2 baths, full kitchen and a 4 person hot tub. The gas fireplace in the living room makes for a romantic and relaxing experience. Step outside onto the deck for a breath taking view or move down to the fire pit for a little bonding time. Move a little further down the shore and wet a line hoping to hook the "big one". The 42" flat panel TV in the living room features a wide array of TV channels. Wifi is also here so you can stay connected! There is a lower level game room with a pool table and a sun-room overlooking the lake. We provide all bed linens, towels, cooking utensils and appliances. 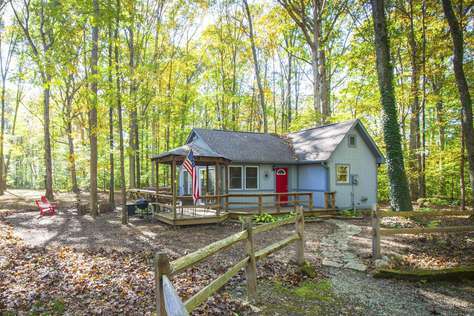 This is a very private location yet convenient to either Nashville or Bloomington. Soaring Eagle is just 17 miles from Nashville, 30 miles from Columbus IN, 17 miles from Bloomington including Indiana University and 8 miles from Brown County State Park. ***Need more room??? Lake House is right next door! !